I recently had the fortune to receive a complimentary tasting sample of three bottles of Cava, the world’s second-most famous sparkling wine. Catalonia, that feisty, autonomous region around Barcelona, produces the vast majority of it, and two companies, Codorníu and Freixenet, dominate this production. 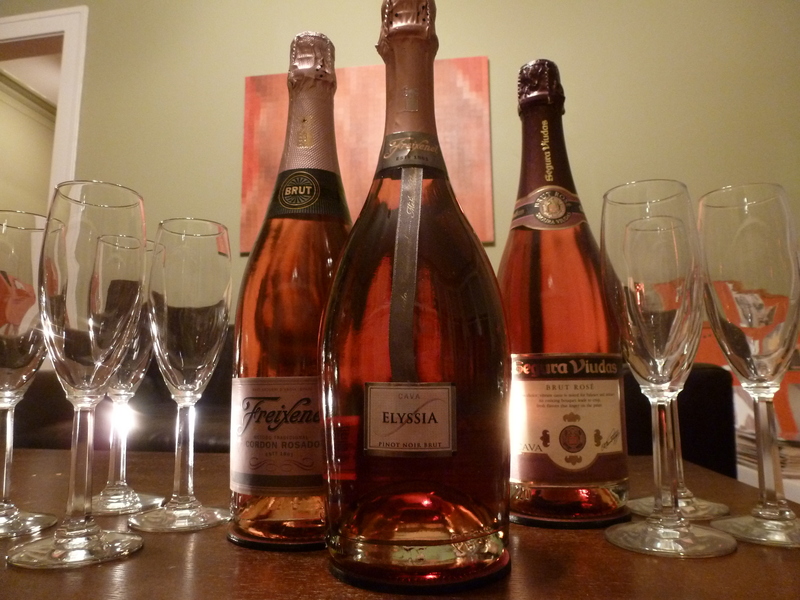 Freixenet (pronounced “Fresh-eh-net”) Cava may not seem especially unusual or obscure, but these three Cavas were all pink. Rosé Cava really came into its own only in the late 1990s, perhaps hindered until then by Cava traditionalists who “…for some bizarre reason always considered black grapes in a white Cava to be sacrilegious,” according to The Sotheby’s Wine Encyclopedia. The Encyclopedia goes on to describe how Manuel Duran, then chairman of Freixenet, experimented with black Spanish varieties, producing a notable Monastrell-Xarel·lo sparkler in 1997. I looked forward to seeing what Freixenet had been up to since then, and organized a little party to find out.